One of the main attributes of plastics materials is their ability to be moulded into a finished component with no need for subsequent work to be carried out. Complicated shapes, holes and undercut features can be moulded into the component using tooling and moulding techniques. However all this comes at a cost of tooling expense. Moulding tools and forming equipment used in the various plastic moulding processes are invariably hand made one off creations. They can often take weeks and months to manufacture with a resultantly high cost. Where a plastics component is specified and the numbers to be used are not large, then machining the component becomes more economical. Not all plastics materials can be machined. The more rigid a plastic then the easier it is to be machined. The more flexible and the softer plastics are not suitable for machining. What are the main points to note when machining plastics? 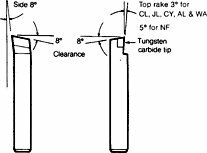 The cutting tools used in the machining of all materials rely on the rigidity of the component being cut. In the case of cutting metals, the materials' natural rigidity is good. Therefore the component resists distortion when the cutter (saw, drill or machine bit) cuts the metal. In the case of plastics, machining tends to lend itself better to rigid materials, such as fibre reinforced thermosetting plastics materials, glass reinforced nylons, acrylic or PEEK have good relative stiffness. Less rigid plastic tends to deform and bend away when the cutter attempts to cut the component, making the achievement of fine dimensional tolerances difficult. Due to the softer nature of plastics materials, the holding jigs and fixtures have to be designed with jaws which protect the plastic being machined, this can be with other plastics materials shaped to the form of the block being machined. In addition the jigs require to be robust in order to support the material being cut. Thermoplastic Plastics Materials being machined can be cooled with an air blast providing the resultant swarf is continuous and not in chipping form. Thermosetting plastics can be cooled using a liquid coolant, but care needs to be taken in terms of plastics prone to swelling in water to ensure that machined dimensions do not change. Heat generated in the process can cause thermal expansion – this effect must be factored in as dimensions may alter on cooling. If the shape to be achieved is round, then a simple turning operation can be used. Specialist supplementary equipment attached to the lathe can extend the capabilities of the lathe's operation. This method of machining can vary from simple milling to profile and CNC milling. Again as with lathe work, either additions to the milling machine, or the use of a more complex milling machine can extend the milling machine's capability to make more complex shapes. Invariably this method of machining is solely for parting off sections of plastic material from bar stock for subsequent working by other machining operations. In certain cases the use of die cutting of plastics material can produce a simple component. The process is limited to sheet material. A male and female die are used to punch out a predetermined shape. The process can be either a manual process or automated using a special machine. The softer less rigid types of plastic can be cut using a hot knife to slice through the plastic. An electrically heated wire or blade melts the plastic locally. This type of process is commonly used to cut blocks of foam and Expanded Polystyrene (eps). Certain shapes can be cut on metal type punching presses. Like a CNC machine, they are invariably computer controlled and are multi tool bit equipped. This process is limited to the thinner thermoplastic and thermoset sheet. This process is used to edge trim fibre reinforced thermosetting components, which would otherwise prove difficult to trim by other processes. The tough reinforcing layers in the material defy trimming by conventional knives and cutting equipment. The narrow cutting path and fast progess without dust or chippings are an advantage. Acrylic and laminated sheet can be separated by means of scoring using a sharp knife and breaking about the scored line. This process can be used for cutting and profile boring of certain types of acrylic and other plastics although not thermosetting. The process uses an industrial laser to melt the plastic often with computer controlled profile following. Some of the softer thinner plastics can be cut using ultra-sonic equipment. The high frequency generated by ultra-sonics in the tool, have the effect of locally melting the plastic being cut. Again, integrated with computer profile control the process lends itself to high speed automated production lines.